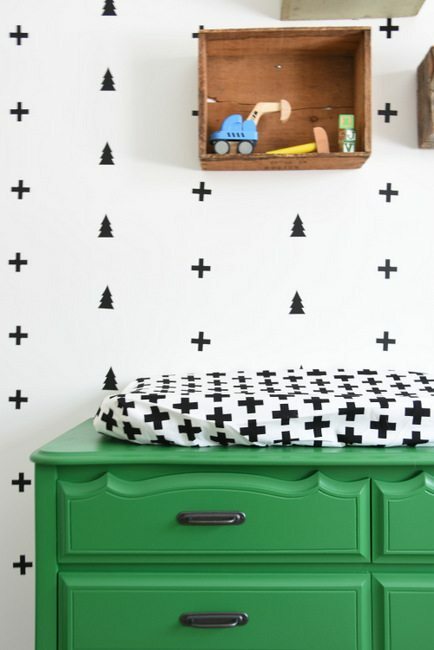 When I was dreaming up my sweet little boy’s room, I knew that I wanted a scandinavian feel. 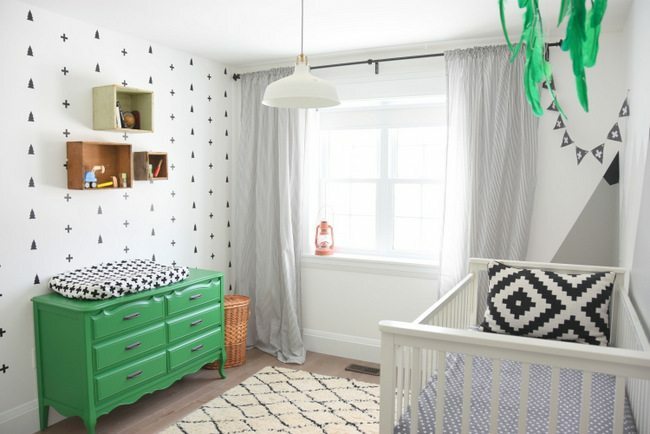 I was thinking a minimalist black and white nursery, but with a bit of kelly green and rustic charm thrown in. I wanted it to have a monochrome meets camp-y vibe without going over the top. 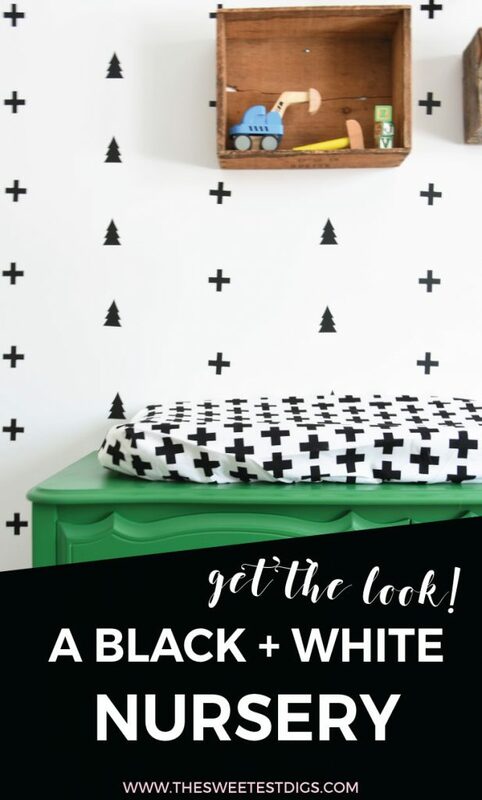 I knew I could get that black and white scandi-look using some decals. 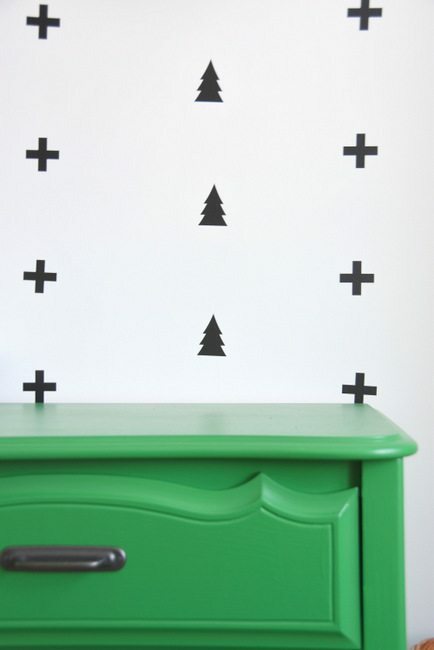 When I saw these swiss cross decals and these pine tree decals from WallsNeedLove, I knew they were going to be perfect for a feature wall. I couldn’t decide which one I liked better, so I decided to do a little mix ‘n match situation. Actually putting the decals up was a no-brainer. 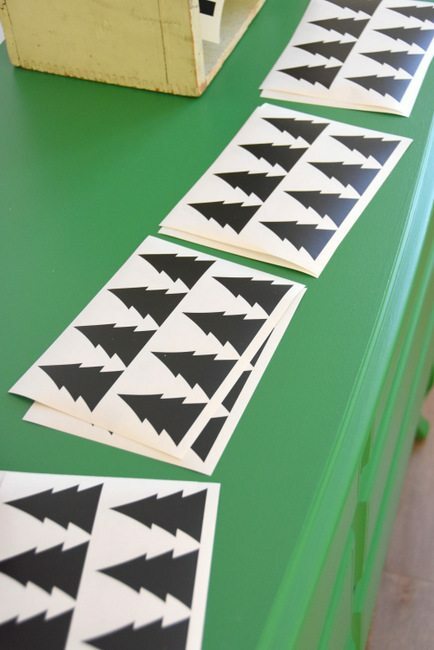 They come on sheets, and it’s recommended that you cut out each shape and tape them to the wall for perfect placement before taking off the backing. Because these are on the smaller side when it comes to decals, you really don’t need to worry much about bubbles or working really precisely from one corner to the other when applying. I found that they went up on the wall incredibly easily and I didn’t have any bubbling issues. 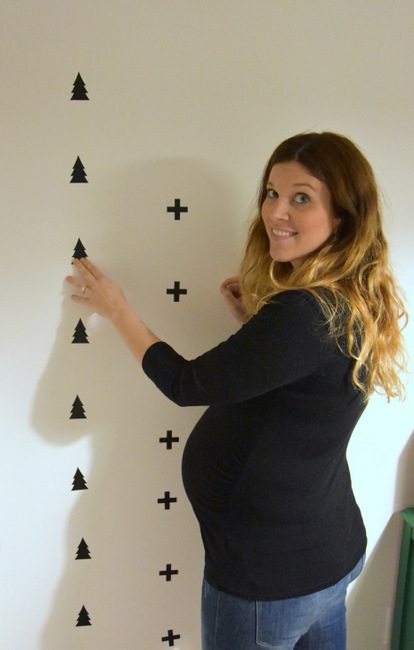 Being 35+ weeks pregnant at the time, I was in no mood for a whole lot of measuring, so I used a ruler to evenly space the decals out as I went, but I didn’t mark anything or tape anything up beforehand. If I had wanted (slash had more energy and patience) to be more precise about it, I would have marked out each spot on the wall first using a level and tape measure, ensuring perfect spacing and level placement. However … #lazygirlDIY won out. The good news? They turned out looking pretty damn sweet, despite the lazy factor. The whole thing came together in about an hour. I chose to do stripes of each pattern in a staggered approach (ie. 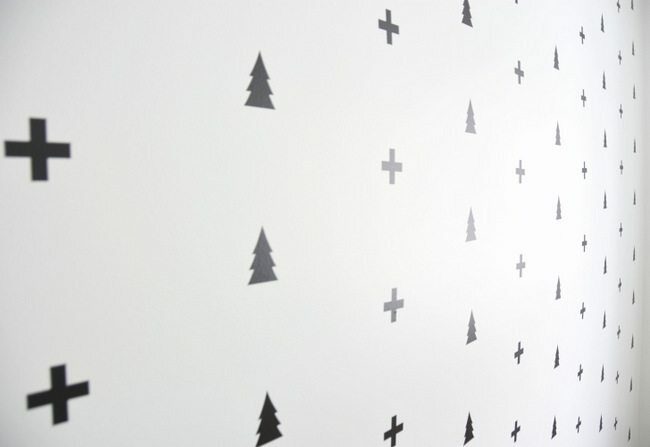 not having the swiss crosses and trees line up perfectly). This gave me a bit more wiggle room for error as you wouldn’t notice one being off as much when it’s in a staggered pattern. Major, major love, you guys. I’m obsessed with how graphic and fun they are on the wall. Serious props to WallsNeedLove for having such fab products. And the bright green dresser (it was an old white one that I dug out of storage and painted) is the perfect pairing. That swiss cross change pad cover is AMAZING. The quality is awesome and I love the look. I also grabbed this matching swiss cross crib sheet and this grey and white triangle one. Honestly, I can’t recommend these products enough. They are so much nicer than the cheaper department store covers I had bought for Maya’s room. The other element on this wall are the boxes. I didn’t want to hang any artwork on the wall as I felt it would be too much with the decals, but it was looking a little bare without something. We affixed them to the wall VERY securely using drywall anchors. Those bad boys aren’t going anywhere. They are also high up enough that baby boy won’t be able to easily reach or kick them from his change pad, and frankly when Maya got that big in her room, we were mostly changing her on the floor, anyway. I like putting up boxes /shelves / ledges to add dimension to a room – it makes the space feel less flat, if that makes sense. I also think these particular boxes add a nice rustic look. I have repeated that same wood tones in a few spots for continuity. Here is how the room is shaping up as a whole. I’m still playing around with a few things to get it “right”, but it’s coming! 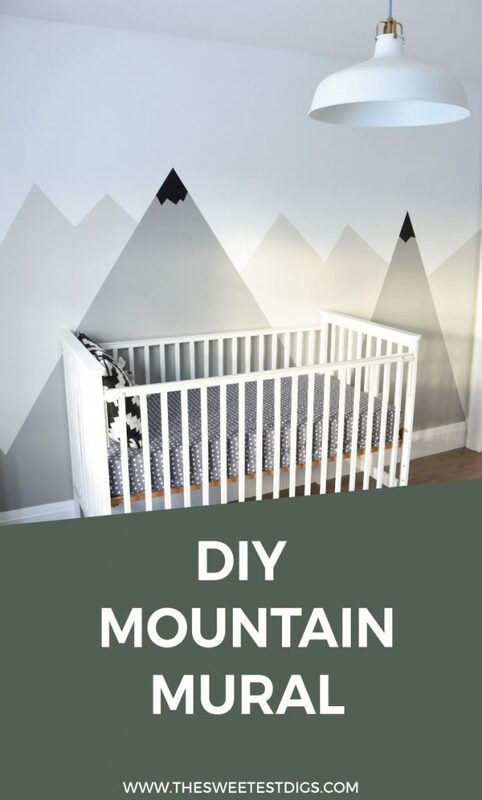 Get the scoop on how to create the DIY mountain mural I painted on the opposite wall in the room. 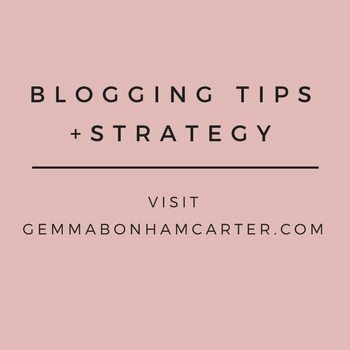 It’s killer and really easy to do. Def head on over there for the how-to. 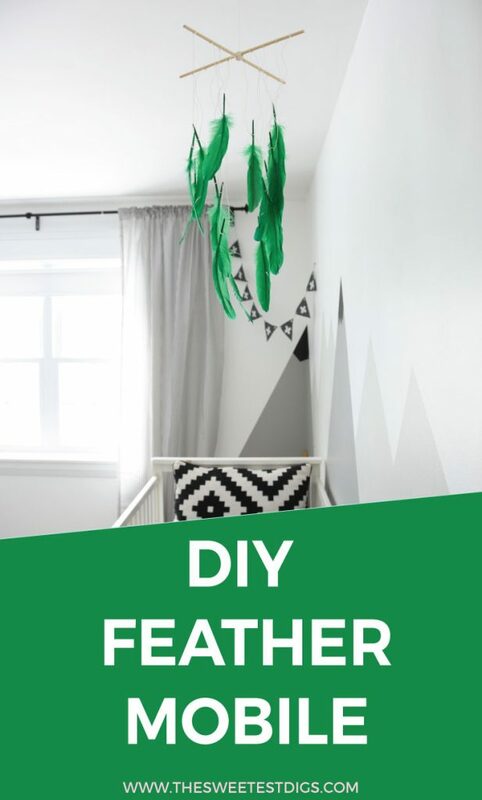 And you can head here for the DIY feather mobile that literally only takes 10 minutes to make. Disclaimer: This post has been sponsored by WallsNeedLove. 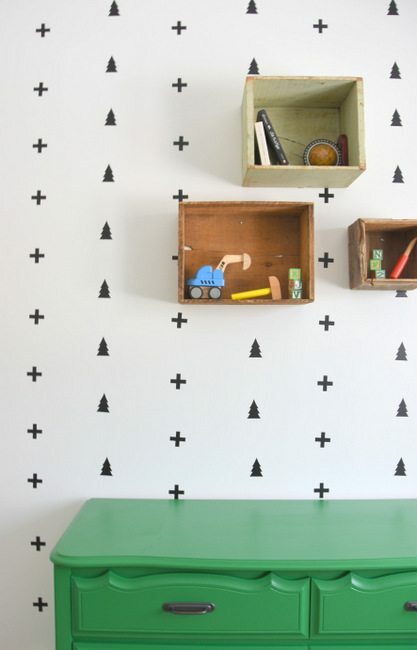 I’m totally OBSESSED with their decals and removable wallpaper. 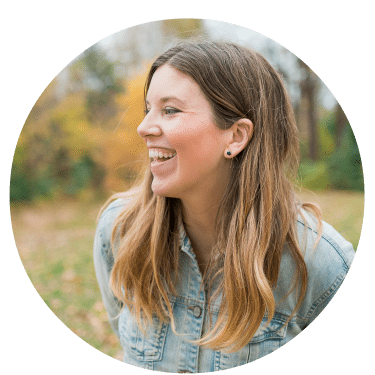 Thanks for showing some love to the businesses that support this blog! Umm this room is stunning! I love everything about it. Colour scheme is unreal, wall murals/decals are super cool, and loving that feather mobile! Thanks lady!! It was a fun one to put together! Awesome! We LOVE how the room turned out. You know what? I can’t remember the name of the paint. I’m so sorry! It was by Para Paints, and it’s basically a nice bright kelly green. Good luck with your room AND with the arrival of your sweet new baby boy!! Hi! I was wondering how many decals you ended up needing? 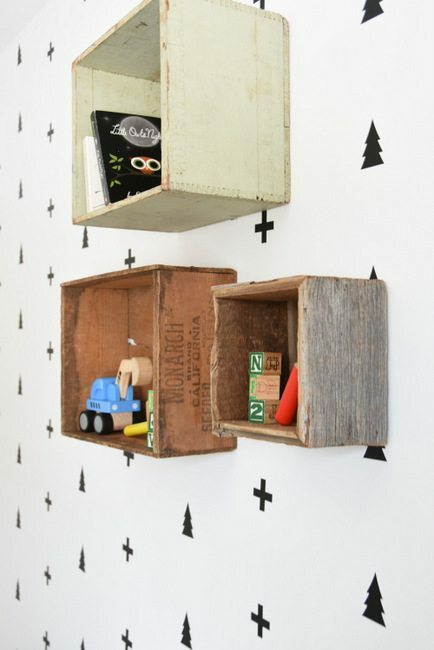 I am going to do something similar with my sons wall (the no measuring lazy way)!